Nobody expects the No. 27 pick in the draft to average 16.1 points on 45.0 percent FG’s and 36.6 percent 3’s, plus 6.3 rebounds, 1.8 assists and 0.6 steals in 31.2 minutes per game, at least not as a rookie. Of course, since the Lakers were the team that selected Kyle Kuzma after three years as a Utah Ute, perhaps they had a better indication than everybody else just what he could do on the court. But here’s the thing … Kuzma couldn’t care less where he was drafted, at least in terms of what his ceiling is as a player. On the contrary, he’s not feeling any type of ceiling on how good he can be, especially because he wasn’t a lottery pick. So, instead of being satisfied with his spot on the All-Rookie First Team, Kuzma’s been going at it even harder this offseason. Ultimately, he wants to be the MVP of the league. That’s his stated goal. MT: You’ve been working right here in this building for basically the entire offseason. Did you pick up any extra motivation after free agency concluded, especially with LeBron’s decision? Kuzma: It has, because it means we’re going to win now. Everybody, not only me, has to step it up. For me, I just want to be a great player, and that’s what it’s going to take. I’ve always been a self-motivated guy for basketball. MT: After the season, your coaches emphasized their appreciation that, after your hot start as a scorer, you kept trying to improve your defense and other aspects of your game aside from scoring. Do you recall some of those conversations and what you were thinking? Kuzma: I think it was after the game I had 38*, they started (messing) with me. Ha, I’m just playing. No, it was just that I was scoring the ball easily, and I feel like that’s always going to be there, and they see that too. They know how good I want to be, so in order to take those steps, it’s just making my teammates better, playing defense and trying to buy into being an all-around player. I think this summer, I took that approach to another level. 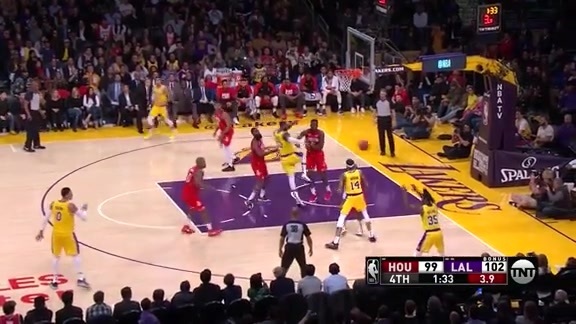 *Kuzma’s season high came at Houston on Dec. 20, when he hit 12 of 17 shots and 7 of 10 3’s to lead L.A. to one of its best wins of the season. MT: Last year, I recall a conversation with Brandon Ingram in which he said he’d realized how difficult it is to truly play on both ends of the court, and why there are so few NBA players that can make a consistent impact on offense and defense. You feel that? Kuzma: For me the summer has been all about my body. Just taking care of it, and really trying to be in the weight room pushing myself, so the work I’m doing now is not going to make me tired in April. Just trying to be in elite shape, getting on the track and running. The biggest thing about being a two-way player is being in shape, because like you said, it is hard to play both offense and defense (well). When guys get tired and you can keep going to that next level of cardio, that’s what I’m doing this summer. MT: And there’s no way to truly get into NBA shape until you’ve played in the NBA and seen what it takes, I assume? Kuzma: Yeah for sure. Until you’re a rookie, you don’t know what NBA game shape is. Summer League was different from college, and that was the first step, but that’s way different from the NBA, too. It probably took me about 15-20 games to really understand what the NBA style was, but for this year, I’ve already played 77 games. I understand what it takes to pace yourself but also play at that high level as well. MT: What’s been the focus of your offseason regimen? Kuzma: We’ve worked on a lot of perimeter skills and playing at the three. Last year I played the three and the four, and I’ll probably play (both) this year, but just to develop my game as a perimeter guy. Reading passes. My handling. Just working out as a guard really helps your overall game. MT: How much better are you now, in early September, than you were in April? Kuzma: A lot. A lot better. Totally different. I’m stronger. I got more handle. I watch more film now to really understand things on the floor that I didn’t see last year. MT: How can you specifically tell you’re better? Kuzma: Just my strength level. Being in the weight room has helped me. Defensively it helps because I’m not getting backed down easily. My legs are stronger so I can move my feet better. Film has really helped me this summer from watching other players and seeing passes that I wouldn’t see last year when I’d probably shoot it. It’s funny, Luke (Walton) today said ‘Man, you had a skyhook that you would have shot,’ and I passed to JaVale. It’s good to see growth coming from that. MT: Do you mostly watch film alone? Ever with any coaches or teammates? Kuzma: Mostly solo right now. But I started watching with Rondo. He’s probably one of the best at watching film, but I just started that. It was usually by myself. MT: What are some things you’ve been noticing while watching game film? Kuzma: Plays. Reads. Watching the weak side and understanding two-man games. Pick and rolls. Understanding that if I drive, somebody has to drop if somebody is going to be open on the weak side. Just those little nuances. MT: The guy that you’ve been spending the most time with here at the facility over the summer seems to be Josh Hart. I have to imagine you guys really relate to each other, being overlooked as the No. 27 and No. 30 picks last year, and then outplaying your positions? Kuzma: Yeah for sure, especially with Josh. I was very happy for him this summer. I think he came in with the right mindset to Summer League as a second-year player, saying ‘Yo look, I gotta dominate these rookies.’ For him, I think he showed the organization what he can do as a go-to guy. Of course we got LeBron, we don’t need him to be a go-to guy, but I think he showed his worth a lot more and I’m very happy for him after his dedication all summer. MT: And meanwhile, the friendship has grown? Kuzma: Oh yeah, everybody, we’re all very close. Josh tries a little too hard on Instagram, but no, we’re all close. I’m always here (to check him). MT: I know you’re not a Fortnite guy, but does Hart still go hard at it? Kuzma: I don’t know if he does still. He’s kinda been quiet about it on social media. I think he’s growing up a little bit more. He probably still plays it, just not in the public eye. MT: Have you enjoyed yourself this offseason outside of the Lakers building? I know your work here has been the focus, but have you allowed yourself some room to enjoy the city? Kuzma: Not really. I keep it simple. It’s kind of hard to really go places and just chill. So for me, it’s just coming in here, work, hang out with my friends and keep it simple. MT: So it’s a little harder to blend in when you’re 6’9’’ and coming off an outstanding rookie season as a Laker? Kuzma: Yeah, I don’t go to malls. I’ve just always been a simple person. I hang out, work out. That’s what I think is fun. MT: What do you do when you’re at home? Kuzma: Watch TV. Sleep. And play FIFA. Kuzma: Bayern Munich. We’ve got (James) Rodriguez, (Thomas) Muller, everybody we need. MT: Must be nice having your team win the domestic league every year. Have you played any of your teammates lately? Kuzma: I played JaVale (McGee) and whooped him … like 3-0. Then he beat me the second game, but it was 2-1 on some B.S. penalty kick. MT: I’ve told this story before, but my first year covering the Lakers in 2008-09, I remember Adam Morrison, Luke, Jordan Farmar and Lamar Odom playing four player FIFA on the plane. They brought the X-Box on with two monitors they placed back to back. Kuzma: Yeah … Josh has one! We’re gonna have to do that. I’m better at FIFA now because they used to play on the plane last year and I’d just watch because I wasn’t that good, but this summer, I don’t do nothing but go home and (a lot of times) I’m playing FIFA. MT: That’s your main game? No “Call of Duty” or “Assassin’s Creed” or anything? Kuzma: No. I play (NBA) “2K,” but I like FIFA better. It’s more fun, something new. For 2K, all I do is play with the Lakers every game, and it’s kind of boring because I try to play the right way now. Kuzma: I’ll come off pick and roll and I’ll always hit the next guy and get a wide open shot. And like, that’s also helped my IQ on the basketball court. I promise you. MT: Does playing the right way end up benefiting you in the game? Kuzma: Oh yeah. I get an open shot every time, and I play with the Lakers, so I know how to shoot with everybody. I get perfect shots all the time. Kuzma: It’s kind of tough with ‘Zo*. But I just found out that with ‘Zo, if you just throw it up to him and he’ll be in the midrange, you pause for a second and he’s open, it’ll go in. But if you try to swing it to him, it’s harder. *The ability for players to make shots in the game is of course influenced by their rating, and Ball shot 36% overall as a rookie. MT: Lonzo did have that strong shooting stretch in the middle of the season before he hurt his knee. He hit a bunch of triples in late December and early January at a pretty good percentage. Clearly 2K isn’t reflecting that stretch! Kuzma: Yup, he was hitting open threes. He’s improving. You can see right now. * He’s been in the weight room a lot, working. *Ball was going through a workout while Kuzma and I talked. MT: Is he any different now that he’s a father? Kuzma: He’s more mature now. For sure. MT: You’re going to get 100 LeBron questions at Media Day coming up, so let’s just keep it to one here. What was your reaction to hearing some of his comments about how he’s specifically impressed by you and what you can do? Kuzma: LeBron is a Mount Rushmore player in NBA history, so for him to say he’s a fan of my game is a great compliment. But you also have to take it with a grain of salt, because you don’t want to get caught up in that. For me, it’s great, I love it, but keep working. Keep letting him love my game. Kuzma: I learned in college that the only people who matter are your coaches and your inner circle. Everybody else, you take with a grain of salt. MT: If you’re a college player who wants to get to the NBA, it’s a little naïve, to me, to think that you can just be a team guy. You told me last year that you have to be thinking about improving your specific skill set to fit at the next level, if that’s your goal. How does that balance shift when you get to the NBA? In other words, can you be both a great team player and want to be great individually? Sometimes that lines up perfectly for guys, but what if it doesn’t? Kuzma: For sure. Of course, the goal should be the team, because if the team wins everyone wins and looks good. But you don’t want to be playing (10 minutes a game). I want to be a great player. I want to be a Mount Rushmore player. You can’t do that just by totally buying in; you have to buy in, but it’s just a grey area. You have to still do your thing. You can’t just stand in the corner. MT: What was it like bouncing between the 3 and the 4 last year, and how much do you think you’ll do it this year? Maybe a little small ball 5? Kuzma: It’s different because on offense, you’re handling the ball as a three, and setting screens as a four. But Luke makes it so everything is so interchangeable, that I don’t think it matters too much what position you play. I did that last year at the 3 and the 4 and sometimes the 5. It’s all interchangeable as long as everybody is moving it and sharing it. MT: Do you think there are still things you have to do to prove you should be on the court in high leverage situations? Did you already do that last year? Kuzma: Just do what I did last year. I think in the fourth quarter, that was my time. That’s where I thrived, playing under pressure in clutch situations. I love that. I think last year I showed that to everybody that I was capable of doing that not only in the early part of the season but the last 20 games of the season, closing out games like the Spurs game*, just trying to will wins. I know I’m going to miss shots. Last year I shot 4 for 24 in a game, and 12 for 17 in a game. Doesn’t matter. I’m still going to shoot. One, I’m confident that I put the work in, and I know that shot is going to fall eventually. *On April 4, Kuzma scored six of his 30 points in overtime to lead L.A. to a home win and season sweep over San Antonio. He became the first rookie in league history to notch 1,200 points with 450 boards and 150 made threes in a season. Kuz played 43 minutes on the tail end of a back to back.